Within the webcasts they discuss moving away from themes because it is not current with the curriculum expectation, and does not promote the high order thinking. As educators, our role is to provoke the learning by placing out new materials, asking open-ended questions and extending the learning. Each webcast has samples of ‘inquiry ideas, how to extend the learning, and how a teacher begins the inquiry process. Webcast #2 called Types of Inquiry and #4 The Teacher’s Role in play-based discussed the Inquiry Process; Explore, Investigate, Communicate. In one of the webcasts they show an example of a classroom wall which displays this information. I have a bulletin board that displays these headings and under each I have pictures, documented learning (the oral conversations typed), and of course the student work to show their thought process and new learning. It is a great discussion piece for parents and the students are deeply involved in what they are learning. Since we are in the fall season some things that may be of interest to students are; pumpkins (shapes, types, and how they rot! ), outdoor changes-animals, leaves, weather, and growth and change. The Thinking it Through document has great examples of classroom centres, reflective questions, ideas for materials, and documentation and assessment ideas to capture what the children are learning. Some of the biggest huddles in getting started are; “Where do I start?, How do I make it happen?,and What should it look like in my classroom?” I have organized some ideas below to help you get started. For Grades 1-3, Primarily Play is a great document that describes how to set-up learning centres for independent inquiry and documentation. http://earlylearningcentral.ca/wp-content/uploads/2011/08/settinglearningcentres.pdf . Where do I start? We need to begin from where the students are at. Sometime this is difficult, so we need to get them started. I am going to refer back to my idea of the “Community and Environment”. This is discussed in the curriculum expectations and is great to start off the year. So, how do we incorporate this Big Idea into a centre? What should it look like? As facilitators, you can invite children to sort the materials and explain their thinking, use open-ended questions to stimulate their creative thinking, and allow them to share and talk! Some learning outcomes could be; their ability to sort (Math), development of oral language/vocabulary, and Science-explore and investigate. While they are exploring the centre take your clipboard with you and document what they are saying and take pictures. You may want to use a checklist. You may want to prepare 1 or 2 open-ended questions before hand and sticky note them to your clipboard this way both educators can capture the learning at anytime. Each morning this week the children have checked our butterfly eggs as soon as they walk into the classroom. This morning, before the morning bell rang, we added a few non-fiction books about butterflies to the center. During play time, we took note that almost half of class went to the centre during play time and looked through the books. At one time, 4 children looked through one of the books together and discussed how the pictures of the eggs and caterpillars looked like the ones in our container. 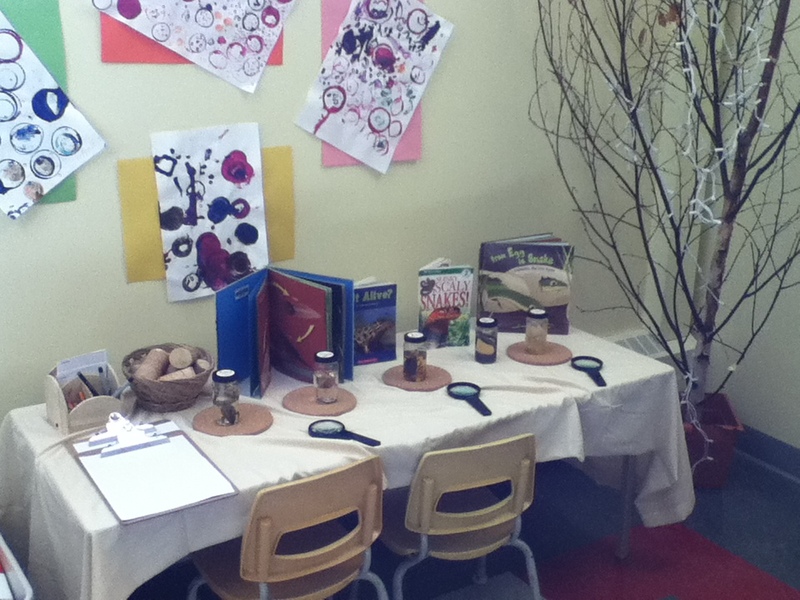 Several children made predictions about what they thought our butterflies would look like compared to the books. It has been wonderful to see how the children are enjoying this real-life science center. Today, we explored substances that may, or may not, dissolve in water. In small groups, we had 5 plastic test tubes of water set up. We took turns adding various substances to the water. Once the substance was in the test tube, we put the stopper in. Each child took a turn shaking the test tube to mix it up. Once everyone had a turn, we let the water settle to see if what we had added dissolved. The children then recorded their answers simply by colouring a happy or sad face beside the picture/word of that substance. We used Kool-Aid, sugar, rice, pepper, and sand. You could use any substances that you would like, that are safe for the children. Today we made goop with the class. Having 28 children in our class, we needed to make 4 batches. We had the children divided into small groups and had a plastic tub for each group. We each took a group. While we were making goop, the other children played, and once the goop was made, we had those children make a new bucket of goop with us. By having the children create the goop with us, we covered math (measurement), science and sensory. It is a great activity that the children loved! It can get messy though, so make sure the children either have art smocks on or understand they need to try to keep away it from their clothing. Add the water to the cornstarch in the bowl. Mix with your hands. Then add a few drops of food colouring and mix again. If you need to add more water, do so with adding only a few drops at a time. You can also add just a few drops to the mixture, if it has been sitting out for awhile. Ask the children questions like “What does the cornstarch smell like?”, or “What does it feel like while you mix it?”, or “What does it feel like once it is done?”, or if you add food colouring, choose 2 colours and talk about how the first colour changes once you have added the second colour. Then, just let the children enjoy the activity! Not all children will like goop. Some children may have sensory issues, and not want to participate. That is okay. Just make sure they are engaged in another play activity during this time. Or, some may just want to observe. With all this interest in sunflowers, flowers and seeds, I have decided to add one more science activity. And this one is one of my favourites! I usually do this activity in the Spring, when flowers are just beginning to bloom. But, with the students’ interest in flowers so high right now, I am not going to miss this opportunity! This activity is simple and easy, and the children usually love it. Yesterday, I bought 6 white daisies. Today, I had 3 clear plastic vases and filled them with water. As a large group time, I set the 3 vases on a table beside our carpet. I had the daisies (I had already cut the stems on an angle), and 3 colours of food colouring beside the vases. With the children’s help, I added red to one vase, blue to another and yellow food colouring to the 3rd. We then put 2 daisies in each vase. We discussed predictions of what will happen as a large group. Over the next few days, we will watch to see if the daisies change colour. I will add their science journals and crayons to the centre so that if children want to record their observations, they can. 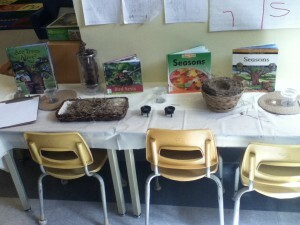 A basic activity, but the students really enjoyed it and are enthusiastic to watch and see what happens to the flowers.